Nyarubuye Genocide Memorial is located about 35 kilometers from the southern town of Kibungo in the Kirehe district, of the Eastern province. 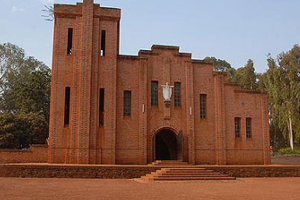 The former Catholic church, nunnery and its accompanying school and buildings of the Benebikira Sisters are a reminder of the appalling violence that took place at this site during the Genocide against the Tutsi. More than 20,000 people were killed there during the 14th and 15th of April 1994.